Culture For One’s five core programs bring the joy and self-discovery of the arts and ongoing support from caring role models to each of the children we serve. A child's first interaction with Culture For One is often a cultural excursion. 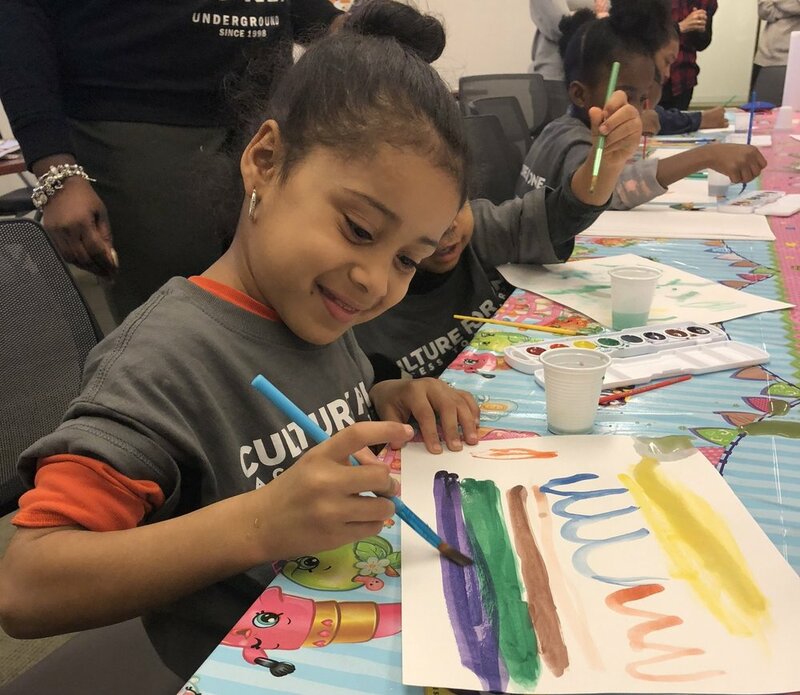 Members of our committed volunteer core take (small) groups of children to experience arts and cultural events, throughout New York City, which culminate in a meal at a restaurant. Children experience Broadway and Off-Broadway productions, museums, dance performances, and concerts, often with behind-the-scenes access. The range of excursions have included Hamilton and The Lion King on Broadway, Alvin Ailey American Dance Theatre, New York City Ballet, Beyoncé in concert, the Metropolitan Museum of Art, the Whitney Museum of American Art, Children’s Museum of the Arts, the Apollo Theater, and Jazz at Lincoln Center. For our teens, Culture For One also arranges visits to arts and entertainment companies to learn about possible career paths, this inspires them to set goals for their futures. Google, NBC Television Productions, RCA Records/Sony Music and the Hearst Corporation have all been part of this program. Please consider becoming a volunteer chaperone, artistic partner, or a corporate host for one of these events. Click here to learn more. When our cultural excursions ignite excitement within a child, we do everything we can to nurture that spark of interest. Culture For One provides arts scholarships that help children in foster care discover their strengths and passions, build confidence and develop skills. The opportunities to study art, music or dance can change a child’s view of themselves and their future. Like all children, those in foster care deserve the chance to find and follow their dreams- passions. For example, we’ve watched our young people learn to look at their world in a whole new way through photography and art direction classes (Teen Academy courses) at the International Center of Photography (ICP). In addition, we have supported another student's interest in architecture through a drawing scholarship at the Arts Students League. To date, we've awarded 170 scholarships in music, visual arts, theater and dance. To supplement and reinforce our cultural excursions and bring access to the arts directly to young people in foster care, we offer creative and career workshops on the premises of our foster care agency partners. Our weekly workshop programing has provided more than 590 activities, to date, from dance and art classes, to drumming, playwriting and teen cooking classes. Our career workshops help equip young people for successful entry into the workforce by providing career insights, social skills development and helpful professional contacts. Working with a pre-school arts educator, we develop age-appropriate, themed activity package (packet), based on a children's book, for children aged 2-5 to take home and complete with their foster parents. Every arts and crafts and book project (packet) is designed to stimulate creative development, encourage reading and create bonding opportunities for caregivers and children. One of the most challenging times for young people in care is their transition out of foster care. Next Steps Connections Program pairs youth in foster care with adult mentors. Mentors serve as positive role models, help our youth build their social skills and guide and support them as they transition to independent adulthood. Next Steps Connections is embedded in our arts and cultural programing, and offers our mentors and mentees no-cost activities for discovering new mutual interests while developing consistent relationships. Culture For One is a simple but powerful idea. It provides opportunities for children to develop their cultural literacy, confidence, creativity, and educational goals. It also narrows the opportunity gap by ensuring that even the most vulnerable and impoverished children experience New York City’s rich cultural life. The work of Culture For One is critical to the future development and long-term growth of youth in foster care. Exposure to the arts is key to assuring them a strong, successful transition to adulthood and freeing them from the intergenerational cycle of foster care, poverty, and hopelessness.